the distinction drawn by Emile DURKHEIM (1893) between two types of SOCIAL SOLIDARITY: mechanical solidarity, based on the similarity between individuals, the form of solidarity predominant in simple and less advanced societies, and organic solidarity, based on the DIVISION OF LABOUR, and complementarities between individuals, the form of solidarity ideally occurring in modern advanced societies. 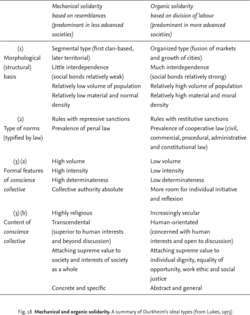 Durkheim formulated the distinction between the two types of solidarity by identifying the demographic and morphological features basic to each type, the typical forms of law, and formal features and content of the conscience collective, which ought to be associated with each type (see Fig. 18). The reality, Durkheim argued, was that in modern societies organic solidarity was as yet imperfectly realized. See also INTEGRATION. Waltz distinguishes domestic and international structures in terms of Durkheim's typology of mechanical and organic solidarity and the corresponding segmentary and organized orders. Be that as it may, I argue that the critique of Waltz's use of Durkheim would certainly strike home were the emphasis placed on what Durkheim had to say about the difference between mechanical and organic solidarity, their relationship to law and authority, and the notion of mutualism. To begin, Waltz confuses the relationship between anarchy and hierarchy on the one hand and mechanical and organic solidarity on the other.